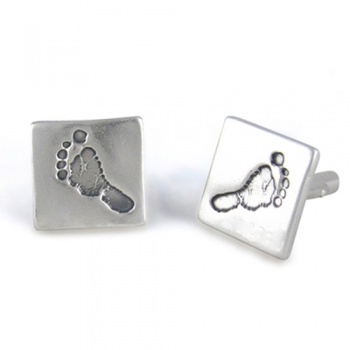 Non-matching Classic footprint cufflinks are about 1mm thick and can have different single hand or footprint on each cufflink. Non-matching Classic footprint cufflinks are about 1mm thick and can have different single hand or footprint on each cufflink. 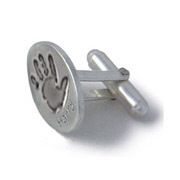 We can normally fit a name or initials too depending on the cufflink shape and prints chosen by you. The inkless print kit needed to take your hand or footprints is included in the price. You can have the prints of two children, one on each. You may need to purchase an extra inkless print kit for the second child's prints especially if they are over 1 year. 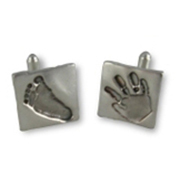 Please note: The best result is acheived from a single print but we can also fit two feet on the square cufflinks.